I’ve realized, once again, that I have a pattern of trying to find the right thing(s) that I can master/fix so I can hit cruise control and never have problems again (aka, once I know/do/be ___, I’ll be good/acceptable/okay). I’ve written about it here several times. It makes sense given my perfectionistic and controlling tendencies, but it tends to make life insanely stressful and not very fun. I’ve been trying to figure out how to NOT fall into that pattern (although, let’s be honest, I’m kind of scared that I’m trying to make it into my next ___ that I think will solve all my problems; the irony is delicious). I know that accepting where I am and working from there is the right direction, but tonight I figured out a metaphor that might help me put it into practice a little more easily. If my life is like driving a car, I keep acting like there will be some way that I can just set to cruise control for the rest of it. But as we all know, cruise control is definitely NOT something that can be used all the time -- it can only be used in certain situations, and even then, you still have to be paying attention and ready to hit the brake and get out of it if you need to. (I realize that some people use cruise control a LOT more than I do, but the point still stands.) To be a good driver, you need to be aware of your current conditions and adjust to what’s going on around you. You never know when someone’s going to randomly stomp on the brakes or a child is going to run out into the road. And I think to be good at life, you have to be aware of and adjust to what’s going on around you, including what’s going on inside you. That’s always going to be changing, and it may not always be what you want, but if you're in denial about what's really going on and refuse to adjust accordingly, you'll either get really frustrated or maybe even end up hurting someone, including yourself. It's the same way you have to brake out of cruise control when traffic starts piling up. There may be a few situations in life that are predictable enough or that you’ve mastered that you can basically set to cruise control (like laundry or cooking your staple dinners or riding a bike), just like you've probably got the basic functions of driving a car down, but no one thing will ever make you master your whole life. Not only does life have a way of throwing new things, both good and bad, at you all the time, but you change, too. I hope that metaphor will make it a little easier for me (and maybe for you) to remember to accept where you are and not try to “fix” yourself in unhealthy ways. And if you need another way to remember, I like to watch this music video from Crazy Ex-Girlfriend to remind myself how ridiculous the idea that something will make me never have problems again truly is. I'm a Christian Who Does Yoga. Here's Why. Matt Walsh’s article about why he doesn’t think Christians should do yoga has been generating some buzz around the internet. While I don’t want to rebut his article point by point, I thought I’d take the opportunity to share why I love yoga and feel comfortable practicing it as a Christian. You may know that yoga has its origins in Hinduism, and there are chants and meditations that directly reflect them. I choose not to do those parts of yoga practice; I “plunder the Egyptians” as my philosophy professor Dr. Meek used to say, and take the physical and mental benefits from yoga and leave the rest behind. If the Calvinist idea that “all truth is God’s truth” is true, and I think it is, then we are allowed to celebrate and participate in the truth in secular and non-Christian thought and practice even as we acknowledge the brokenness and try to avoid the pitfalls. However, this is still a matter of conscience, and if you don’t feel good about doing yoga, you shouldn’t do it, and Christians who do feel comfortable doing it shouldn’t judge you for it. And let’s remember that, as someone on Twitter pointed out (whose tweet I can no longer find, unfortunately), Paul let people eat meat that was sacrificed to idols -- if that can be a matter of conscience, certainly yoga can, too. That said, I think that yoga, at its best, offers physical and mental benefits and a knowledge of how the human body works that serves as a complement and sometimes corrective to the strictly Western view of medicine. Sometimes I think that in American Christians’ desire to avoid the practices of other religions, we reject the truths of Eastern thought in general. Just because something is Eastern doesn’t mean that it’s wrong, and just because something is Western doesn’t mean that it’s right or the only way of doing things. For example, one of the main reasons I do yoga is that it’s very good for treating my endometriosis. The poses and stretches help keep blood flowing and break up adhesions, which also can decrease my pain. If I stuck to a strictly Western method of treating endometriosis, all I would have at my disposal is surgery and hormonal birth control. I’m grateful that these things exist, and I’ve used both of them at different times, but they both have significant costs, physical and financial. Yoga doesn’t. In addition to not having physical costs, yoga also has significant mental benefits. For one thing, it’s great for treating my ADHD. I already wrote about how exercise in general is good for my ADHD, and yoga seems to be particularly effective. It forces you to be mindful and brings you back into your body, which is important when you get too much in your own head, as my counselor would say. I also just feel better about myself when I do it, and I suspect this is partially because of the wonderfulness of the instructor I follow, Allannah Law of YogaYin. (I may or may not have a woman crush on her.) She is gentle and positive, encouraging you to accept where your body is and not judge it, and to do things when you’re ready. I’ve been realizing the importance and power of acceptance a lot lately, and she’s helped me do that. I was brought to tears one day when I realized that God might view me in the same gentle, loving way that Allannah views all of her followers. The peaceful, non-judging ethos of yoga has been immensely healing for my judging, shame-fueled modus operandi. For me, yoga has been immensely helpful, and its benefits outweigh the costs of having to be intentional and careful to not incorporate any elements that are too similar to Hindu beliefs that don’t align with my faith. I hope you can enjoy it, too, and if you do, please help me learn how to make downward dog less terrible. Thank you. The first week of October is Mental Illness Awareness Week. If you've read this blog for awhile, you're probably pretty aware that I'm pretty aware that I struggle with anxiety and depression. And it might seem that I'm pretty comfortable with it since I write about it a lot. I thought I was, too. Not only do I tell people that I struggle with it, but I even will acknowledge that, contrary to what I thought when I first started counseling and taking antidepressants, my anxiety and depression will probably never really go away, and I'll need to manage them for the rest of my life. It's only recently, through the help of a very insightful counselor, that I've come to realize that when I said I would need to "manage," my present-tense mental illness, I really meant "fix," as in "When I take my medication and do counseling and anything else that seems like a good idea (yoga, journaling, etc. ), I should be able to act exactly as if my mental illness is all past-tense." After all, depression and anxiety don't define who I am, right? I'm more than just my depression and anxiety, aren't I? Here's the thing: my identity may not be in my mental illness, but it can and does affect my life. As my friend Tes said, "People say, 'Labels don’t define you.' Yes, but they are part of me." And too often I have found myself trying to suppress that part of me instead of accepting it and adjusting my expectations for my life accordingly. 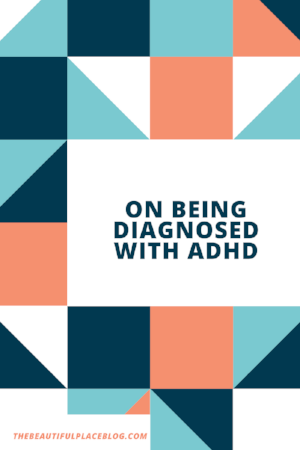 Instead of viewing medication or counseling or yoga or journaling as ways to keep me functioning as best as I can with mental illness, I viewed them as ways to become, essentially, a fundamentally different person who didn't struggle at all. If I just wrote down the positive truths about myself, and did yoga, and x, y, and z, just right, all the effects of my mental illness on my life would be past tense. Specifically, I would become a person who had no longer had trouble getting up in the morning, who didn't get disproportionately nervous about reaching out and getting together with friends, who didn't often find regular chores overwhelming, who could plan an event or and pack for a camping trip without crying, who could handle having a regular full-time job without being completely and utterly spent at home. I would become energetic and fearless and live my best life. And until I was that person, I wasn't okay. Until I was that person, I needed to keep fighting, do more things, reconfigure my system, or else I was letting my depression and anxiety define me and not trying hard enough. Never mind that some days I barely had it in me to survive, much less work harder. Because until I was that person, I wasn't acceptable. This, my friends, is not a great way to live your life. I will cut myself a little slack for thinking this only because sometimes depression and anxiety seem to be more situational, and people do get "back to normal" after a while. They get off their meds permanently, they stop going to therapy, and they're great. But mine is looking pretty chronic. And while you can do things to make chronic illnesses less awful, they aren't going away. I should know, since I have a chronic disease called endometriosis, in which tissue grows places it's not supposed to and causes a lot of pain. 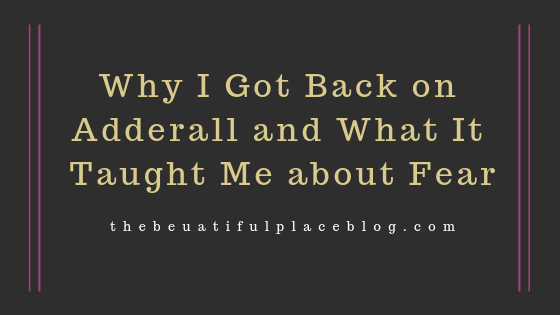 I've learned a lot over the last year about things I can do to stunt the tissue's growth and feel less pain, like changing my diet and taking certain supplements. But I can't cure it, and not only it would be silly of me to expect that, it would also be silly of me to act as if the pain shouldn't affect how I live my life at all. Yet I do this all the time with depression and anxiety. I even did it in the midst of writing this post. Dave and I are going camping this weekend, and while I love camping, I do not love packing for camping. It overwhelms me, a lot. I know this about myself. But instead of accepting it and say, asking for help from Dave earlier in the week, I once again hoped that I wouldn't feel that way and would be able to do it easily, all by myself, with no anxiety at all. Because if I'm honest, I'm embarrassed that it paralyzes me, and I hate that I can't just get my act together and not freak out about it. I hate that I need help and take up Dave's time with something that I feel any regular adult should be able to do. But that's where I'm at, and if I had asked for help sooner, I probably wouldn't have had to freak out about it all. Instead I procrastinated in anxiety, got more overwhelmed as a result, and melted down, and guess what? Dave still had to help me, but in a much less pleasant way for him. Not only does nobody win when I don't accept myself, but when I do, I ironically feel a lot better and struggle a whole lot less. That's probably because I'm living according to the truth of who I am instead of pretending I'm someone I'm not, and Jesus knew what he was talking about when he said the truth will set you free. The truth is that I have anxiety and depression; I'm aware of that. Now I need to work on not getting rid of them, but accepting who I am with them and feeling comfortable with the fact that they affect my life in the present tense. In elementary school, taking tests involved a very specific procedure: the creation of test fortresses. We would open folders and place them around our test papers like walls to render it impossible for wandering eyes to see our answers. (Here are some pictures.) I think sometimes we even added a “roof” to these fortresses so that tall kids couldn’t use their height to their advantage and look over the boundaries. This kinesthetic task was supplemented with the more aural approach: throughout the entire test, our teachers would constantly remind us to keep our eyes on our own papers. But sometimes I wonder if this lesson has really taken hold when “my own paper” refers to my own life. I have a problem with just focusing on living my own life as I think I should -- I always want to look at everyone else’s life around me (helloooo, facebook) to compare and to see if I’m getting it “right.” The problem is, unlike with elementary school tests, there is no one right answer. But when we think there is and look at the person’s life next to us and decide that’s what we’re “supposed” to do, we hurt ourselves because we haven’t done the work to determine what’s right for us. As an example, when I finished grad school, got married, and moved from Minnesota to New York, both my husband and I just assumed that I should find a full-time job. That’s what you’re “supposed” to do when you don’t have kids and you’re just starting out. So I did, and I was stressed out of my mind until I finally left. By then I was very burned-out and very discouraged. Looking back, I really wish that I had been brave enough to look at my own life and realize that starting my first full-time job probably wasn’t the best choice for me at that point. I mean, I had just gotten married to a man who I’d been in a long-distance relationship with and moved across the country to a place that I barely knew, both of which are among the biggest and most stressful changes in life. Given that and my own tendencies toward depression and anxiety, maybe, just maybe, it would have been better to slow down and ease my way in to my completely new life. I’ve since learned that for me, it’s much better if I work part-time. And even though it’s not what most people at my place in life (that I know, anyway) choose to do and it’s not where I thought I’d be, it’s right for me. I’ve worked out the problems on my own test and that’s my answer. Sometimes I get afraid of what other people think, but you know what? They should be keeping their eyes on their own paper, too. And maybe I should still be building those folder fortresses after all, except for now, I’ll build them to guard myself from thoughts that say that my answers are wrong. I might need to occasionally use them to block myself from facebook when I know that I’m vulnerable to comparison. But most of all, I should keep myself busy figuring out my own life, and maybe one day I won’t need those folders anymore.